At first glance, I really didn't like the purple wrap, but the longer I look at this, the more it fits. It gives a bit of *pop* to an otherwise earthy costume, which is great. 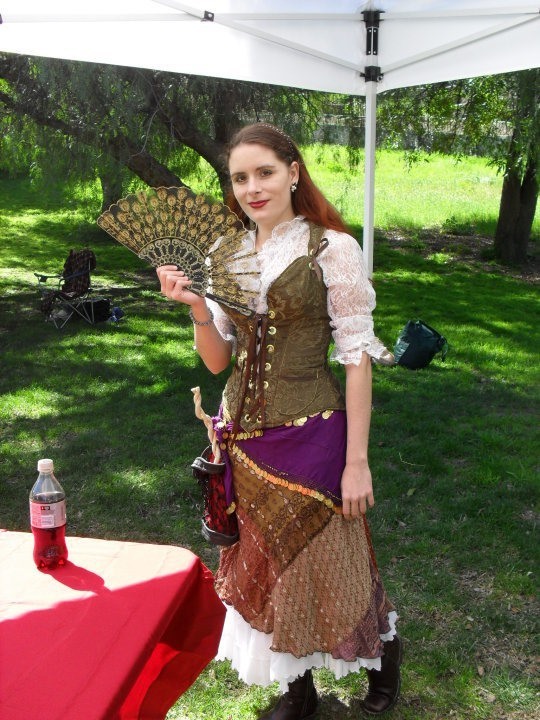 I love the lace shirt and the fan, as well as the fact that this was just pulled out of your stash of costume gear, and I'm envious that you were gifted a corset. Yeah, the purple wrap is because this character's color is purple, so I felt like it needed something. It's also not obvious in the picture, but it jingles when I walk, which is another point in it's favor - this character rather likes attention, to the point of sewing bells onto some of her clothes.